IP Security Cameras - Always peace of mind at home and away. My home is Smart connected and has most of the devices connected and controlled via IP. Smart cameras are expensive, so only have 1 Samsung Smart camera. I stumbled this Camera on amazon and decided to try out. 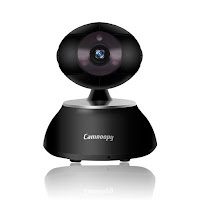 Camnoopy APP that can connect, setup and monitor the camera is available in both Google Play store and App Store, download the app and get ready to setup. There are audible alerts to keep you aware on what is going on, the app is self explanatory to configure with the camera. The camera works only on 2.4gHz channel and not on 5gHz. Don’t be too worried about the click sound etc or the camera looking around during startup , that’s for initial setup and calibration. Ethernet port needs only and supports 100mbps connection. Please note that Ethernet connections are more stable and that will free up your wifi bandwidth. All the settings can be controlled via app. 720p resolution on this camera is of acceptable standard and the video is clear. PTZ (Pan Tilt Zoom) functions works simply fine by swiping the screen on your smart phone / tablet. If you have more than 1 camera and other devices that uses WiFi, set them up to a second WiFi network so your WiFi network won’t be congested for internet. All the devices needed internet can be connected to main WiFi network. Few high lights to note, build quality is excellent comparing to some of the other security cameras I’ve seen. 2 way communication is handy. It helped a lot in my case, as my dad who has Dementia spends most of his time upstairs and If I’m doing my work downstairs I can keep an eye on him and talk to him occasionally to keep aware of what’s going on. Overall a good Camera, certainly that works and give good results straight out the box within few minutes. All you need is to register an account, fill in the basic details and you are ready to watch / talk. Please do check out the pictures to see how it looks in real life.